Winner announced in our Google Nexus 4 contest! Update: This contest is now closed. We’re happy to announce the Twitter follower Scott Baker has taken home the sweet Nexus 4. No worries if this is not you because we currently have out “20 Days of Device Giveaways” happening now – check it out here. Wanna win a Nexus 4? Of course you do! We were planning on combining this pure Android device into our big December contest, but the newly found LTE support (see here) is making us want to give this away sooner than later. The Nexus 4 runs OS 4.2 Jelly Bean, has a 4.7-inch True IPS+ display (1280×768), 1.5Ghz quad-core processor, 2GB RAM, 8MP camera and a 2100mAh battery and unlocked. All that’s needed to enter this contest is either follow us and re-tweet this contest on Twitter (@mobilesyrup), “Like Us” on Facebook (Facebook.com/MobileSyrup), or join us on Google+. All current Facebook, Twitter, Forum members, and Google+ followers are automatically entered. This contest closes on December 10th and we’ll announce a winner shortly after. 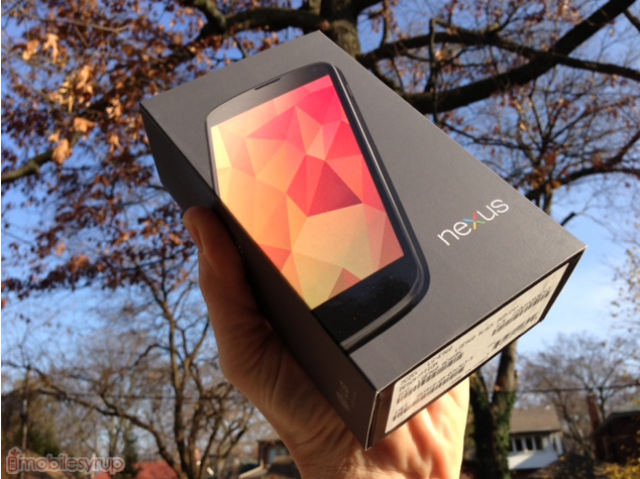 If you’re the winner you’ll have the Nexus 4 in your hands before the holidays! Make sure you check out our review here. Good luck to all who enter!